The departmental park of the Haute-Ile is the last one to have been created by the Seine-Saint-Denis department council. 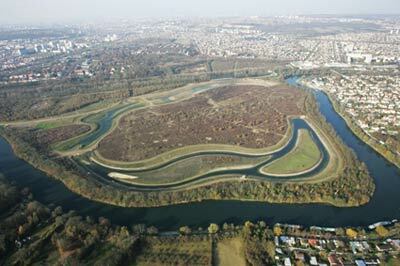 Its 64 hectares are situated in the last Marne meander of the Paris region not to have been urbanized. It offers the discovery of a rich variety of ecosystems: fallow land, wetland, wood and prairie... For its ecological richness and its importance for the urban world of Seine-Saint-Denis it has received the European label NATURA 2000. The park also houses a workshop where the results of local archaeological research are treated. Animations, exposures and workshops : free. Picnic area, Children's playground, Children's workshops, Pedagogical presentations, Exhibition visitation. RER A, stop Neuilly-Plaisance, then bus 113 direction of Chelles (Mairie, or Centre Commercial Chelles 2), stop Pointe de Gournay (across from Point P shop). By local train SNCF, station Chelles/Gournay, then bus 113 direction Neuilly-Plaisance, stop Pointe Gournay.